It's a little known fact that for the most part our services are FREE! Whether you are booking a sun-filled all-inclusive to Jamaica, a Disney holiday or a European River Cruise, we do not charge for these services. We are paid directly from the suppliers and are representatives for the major travel brands in the world, so take advantage, have the best of both worlds, allow us to book your holiday and we will be there to back you up if if you need us. 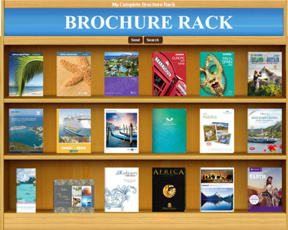 For a virtual brochure rack of hundreds of current brochures from Cruise lines, Resorts, Motorcoach companies, all-inclusives and more click here. You can even sort by destination! For more information or an appointment on how Valente Travel Inc. can help make your leisure or business travel more profitable and efficient, please contact us at (519) 252-3331 or just e-mail us. All of us at Valente Travel look forward to doing business with you in the very near future. Usually a group consists of 8 or more passengers travelling together or to a common destination (even if they're flying from different cities). For Cruise groups of 8 or more, sometimes free berths or cabins can be arranged for the group leader depending on the cruise line. Contact us for more information. Any travel can be completely customized by our travel professionals to suit your particular tastes. We can combine land and cruise packages, cater to a specific theme ie) World War II theme; viticultural theme for foodies etc. Using your airmiles? No problem. We can do the land portion of your trip alone and you can use your airmiles to book your air! We can help with both. If you can dream it up, we can probably design a tour to match.